In some cases, a Message can’t be sent, but sometimes Donut will be able to send it later. Timely delivery of content to new hires and stakeholders is essential to a good onboarding process. We've outlined how to identify when Messages have been missed, and what do to about them. Why Was a Message Missed? You entered an incorrect email address. Double-check the email address for any typos. You entered the correct email address, but the new hire didn't sign into Slack by the date of the first message. The Slack account you assigned to the Role has been deactivated. E.g. you assigned @jane to the buddy Role, but then @jane’s account was deactivated. You didn’t assign someone to the Role that should be receiving the message. E.g. there is a Task for the manager Role but you didn’t put anyone in as the manager. You didn’t assign someone to a Role that is referenced in the message. E.g. the new hire is supposed to get a message that mentions their manager, but you didn’t assign them a manager. A template was assigned to a new hire too late for the scheduled messages. E.g. you assign a template to a new hire 5 days before their start date, but there are messages in the template scheduled to send 7 days before the new hire's start date. The message is an Intro that picks someone random from a channel, but there was no one in the channel to be chosen. If any of these situations arise Donut will send a DM to all the Admins who are subscribed to notifications. It will say what message was skipped and why. How Do I Know if a Message Was Missed? Navigate to the "New Hires' screen in your dashboard. If you see a red exclamation point next to a new hire class, you'll know that class contains a missed message. Select the new hire class with the missed message, and you'll be able to view the specific new hire who missed a message, as well as any stakeholders in their onboarding process including managers and buddies. We also display the templates they're slated to receive. Select the new hire, and we'll display every message that goes to that new hire and their stakeholders. Messages that failed to deliver will be marked with a red exclamation point and "failed." It’s possible for the missed messages to be sent later, except in the case of situation #7 above. 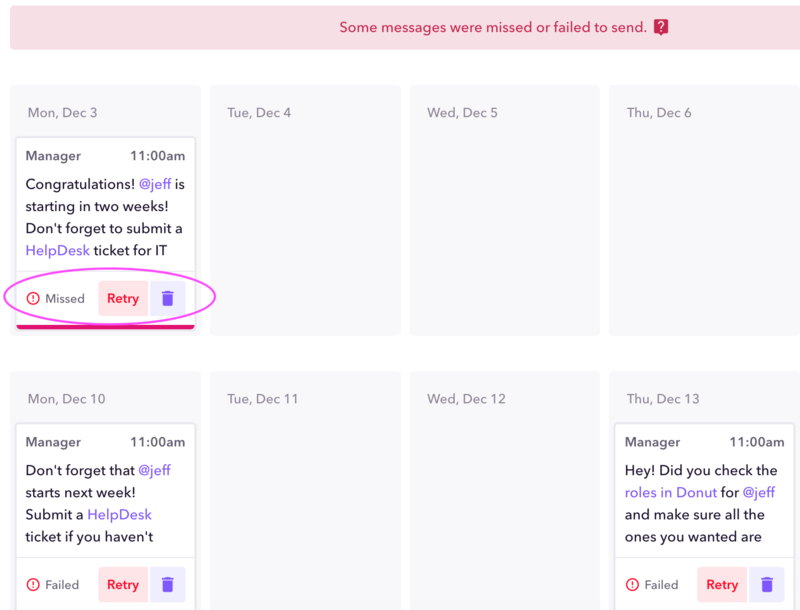 When Donut resends messages, it will also include a footer (see below) that says when the message was originally scheduled to be sent. In situation #2, if the new hire signs up with the email address sometime later Donut will automatically send them any and all missed messages. In situation #3, if the account is reactivated then Donut will automatically send any and all messages that they missed. Note: In situation #1, when an email was entered incorrectly, we will NOT automatically resend missed content, even once the email address has been corrected. To selectively send missed messages, just press "retry" on the message that was missed.